One of the oldest and most popular slot machines at one of the oldest and most popular online slots site has produced a $148,711 progressive jackpot winner. A player who only started spinning the reels at Slotland.com three years ago hit the massive jackpot playing the Lucky Stars slot machine. Lucky Stars is a five-payline slot machine game giving five chances of winning. Each payline which has a bet placed on it can win. Its "Hold" feature appears randomly during play and there is a special bonus round multiplying all wins by 10. Although Lucky Stars is one of the oldest and most popular games at Slotland, it hasn’t had a big progressive jackpot winner since December 2007. All of the slots at Slotland are tied to the same jackpot. Every time a player plays max bet on any of these games, some of the wager goes into the progressive jackpot pool. Hitting the right combination with a max bet placed wins the progressive jackpot. In Lucky Stars, a max bet is only $2. If five bars appear on a line with a $2 bet, the jackpot is won. 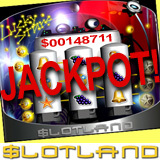 Slotland.com currently features 15 one-of-a-kind slot machines and video poker games. Four of the most popular games, including Lucky Starsd, are also available on mobile phones and PDAs. Slotland’s games do not require any downloading or installation as they are all instant play casino games. Some are now available in Flash format with improved graphics and sound. The jackpot at Slotland was reset to $50,000 after this win. At Slotland’s sister casino WinADayCasino.com, whose games are accessible from the Slotland games lobby, the jackpot is currently over $85K.